A coat helps provide protection from winter's elements, but it also provides a sense of security — especially to someone who is homeless. WASHINGTON — Trystin Kier Francis knows the importance of a winter coat. Sure, it helps provide protection from the elements — bitter cold temperatures, harsh winds and heavy rains. But a coat also provides a sense of security — especially to someone who is homeless. Francis, 33, knows this because he was formerly homeless. “A coat is a piece of ownership. Homeless people don’t own anything, they don’t have any security. When you go into your office or go into your home, you can lock the door; no one can come in. But they can’t lock the door on the street,” he says. On Friday, Francis and a handful of his UDC students attended Thrive DC’s second coat-matching of the season — an event where homeless men, women and children come to the Columbia Heights service organization and try on and select coats and other cold-weather gear. But Francis didn’t simply hand out coats to those who needed them — he and his students styled the 200 to 300 homeless men and women who came through the door. “We’re going to make them feel very comfortable, we’re going to make them feel happy, we’re going to make them feel special,” says Francis, who emphasizes that feeling good and feeling confident is just as important as staying warm. Francis spent four years of his youth, from the age of 14 to 18, on the streets in New York City with his mother. He failed out of high school, but was given a second chance when a former camp instructor invited him to attend an alternative school in East Harlem. “No one ever thought that I would make it, and I was always a smart kid,” Francis says. But he did make it, and even attended and graduated from Benedict College in Columbia, South Carolina. Now, Francis runs his own interior design firm in D.C. and teaches fashion marketing at the University of the District of Columbia. He also serves on the board of directors at Thrive DC, where he gives back to D.C.’s homeless community — people, he says, that look like him. Thrive’s Executive Director Alicia Horton sees the value in Francis’ approach. 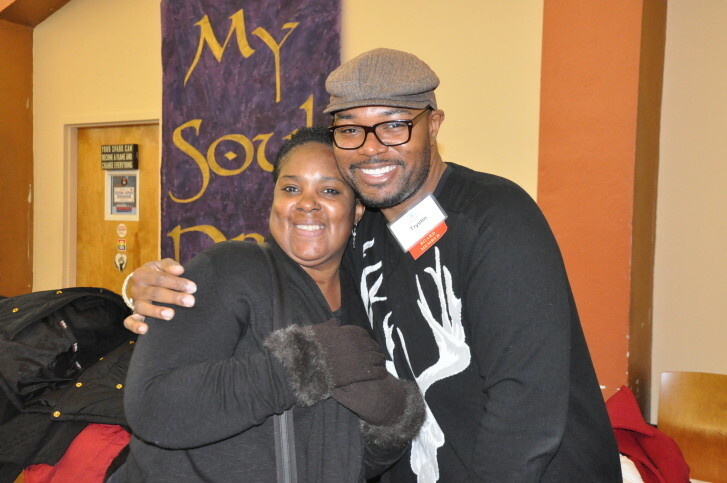 Thrive DC holds three coat-matching events each winter: one in November, one in December and another in January. At Friday’s event, the nonprofit had roughly 500 coats to give away. Thrive will continue to collect coats, scarves, hats and gloves for its upcoming event on Jan. 8. Those interested in contributing can drop off donations between 8 a.m. and 6 p.m., Monday through Friday, at the Columbia Heights office. Thrive can also arrange to pick up larger donations. “This is their protection at night from the cold, and this is something that they can say is mine,” Francis says.